Chinese New Year is literally just a few days away. And we know Chinese New Year reunion dinners or the Yee Sang tossing can be quite hard to plan when you have so many people to put into account. So as we usher in the year of the Rooster, we would like to share with you our TOP 5 Dining Places for Chinese New Year Yee Sang 2017 ! This year, TAO from Intercontinental Hotel KL brings you 5 varieties of yee sang available for dine-in or takeaway. You have a choice of Australian Whole Abalone & Hokkaido Scallop Yee Sang, Hokkaido Scallop, North Canadian Lobster Claw Yee Sang with Passion Fruit Sauce (highly recommended), Soft Shell Crab with Wasabi Sauce Yee Sang, Fresh Atlantic Salmon Yee Sang and last but not least Tempura Mushrooms with Korean Sweet Pear Yee Sang. Prices start from RM 88 nett. The full menu and pricing can be found at their website listed below. Full review at Chinese New Year Specials 2017 @ TAO, Intercontinental Hotel KL. Tempura Mushrooms with "Korean Sweet Pear"
Eastin Hotel's Ee Chinese Cuisine Restuarant features the classic Salmon Yee Sang with White Tuna, Shell Fish, Live Geoduck and others. It is priced at RM 98 nett per serving. Full review at Chinese New Year Dinner 2017 @ Ee Chinese Cuisine, Eastin Hotel KL. 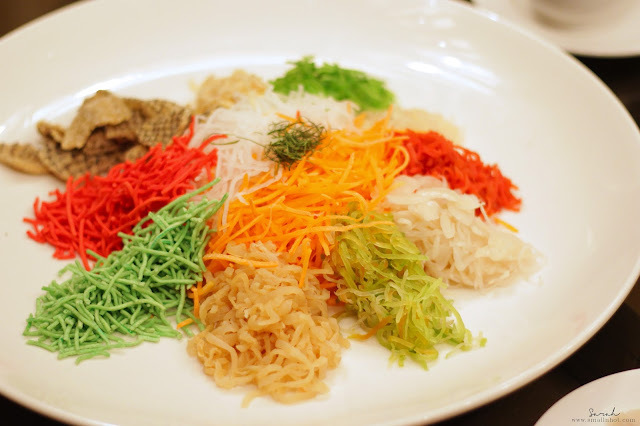 If you are a fan of Yee Sang, then head down to Zende Restaurant in Seri Pacific Hotel KL as they are having Chinese New Year Countdown Buffet dinner which features the must-have Yee Sang and some all time favourites chinese dishes. Other than the buffet, you can also dine-in or takeaway their Yee Sang set, starting from RM 50 nett per portion, with 4 different varieties like Salmon, Jellyfish, Mixed Fruits & Seaweed and Pear & Mango. Full review at Chinese New Year Buffet 2017 @ Zende Restaurant, Seri Pacific Hotel KL. Another lovely place to have yee sang is CHYNNA in Hilton Hotel KL. 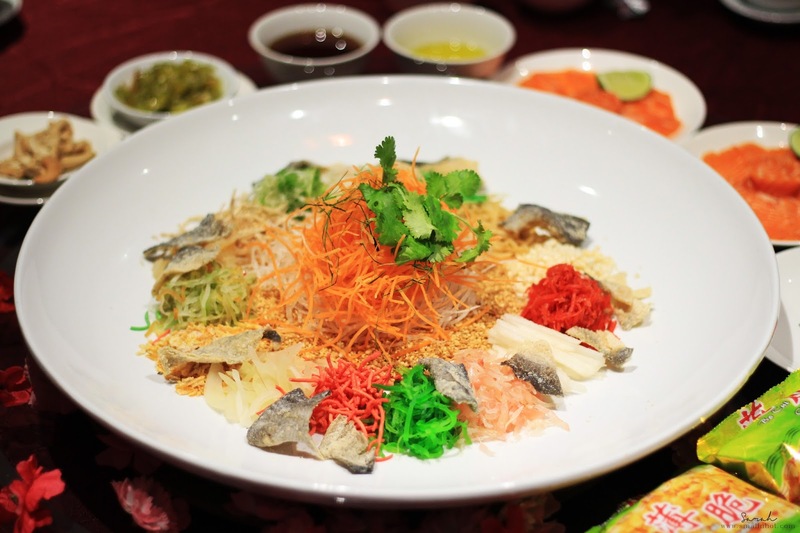 The yee sang here features Premium Chilean Crab with Gold Flakes, Ceasar Salad with Grated Parmesan Cheese, Norwegian Salmon, Australian 3 head Abalones and Traditional Norwegian Salmon. 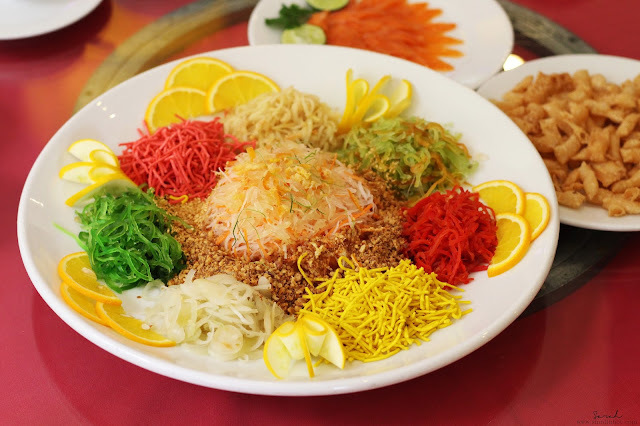 Their signature Year of "Rooster" Yee Sang comes with some interesting ingredients too and the Yee Sang starts from RM 128 per portion. 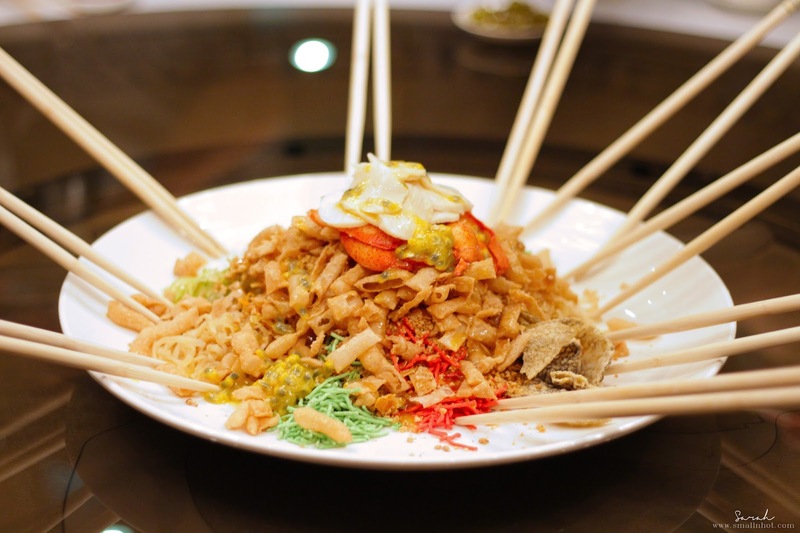 Here's a vegetarian option for those that's looking for a healthier version of the Yee Sang. This Simple Life Healthy Vegetarian's Yee Sang tasted as good as the others, in fact the fruits and vegetable stripes added the refreshing sweetness to the flavour. 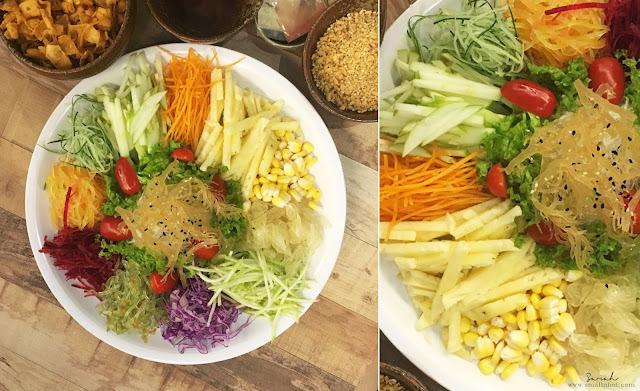 Even if you are not a vegetarian, this combination of fruits and vegetables yee sang is a taste not to missed ! It is priced at RM 38 for 3 to 4 pax and RM 68 for 7 to 8 pax.